Many people around the world are nursing hangovers this morning with some tried and true “remedy foods” – greasy spoon burgers and fries, cool citrusy ceviche, or fruit loaded smoothies. If you happen to be in Puerto Rico and drop by a Spanish bakery in the morning, chances are you will find a few dehydrated faces recovering with a steamy bowl of caldo gallego – Galician broth – in front of them. Caldo gallego is a rustic soup built on a ham hock broth, with large chunks of potato and turnips, white beans, chard (acelga), and bits of ham and chorizo. This creamy caldo gallego has all the same ingredients and proportions as the traditional version – you could leave it chunky and it would be just as good. 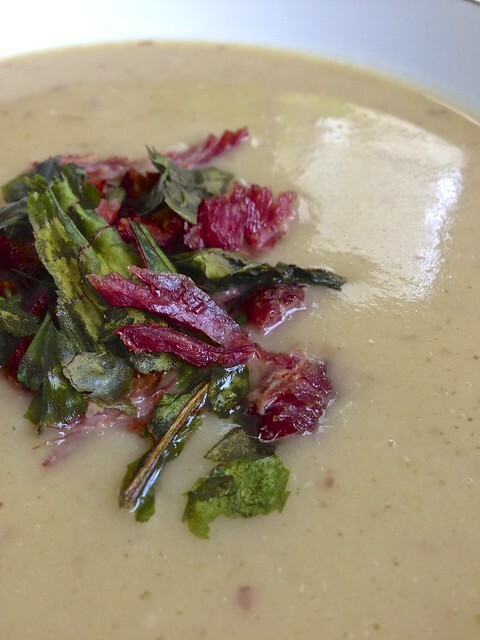 I pureed it because I wanted to create a contrast with fun garnishes: dehydrated chard and crisped chorizo and ham. The cannellini beans give the finished soup its silky texture without adding any dairy or thickening agents. I can’t wait to apply the same technique to other soups traditionally prepared with cream or a flour based roux. To prep for the soup, peel and cut the turnips and potatoes into large cubes. Rough chop the chard leaves and ribs and drain and rinse the beans. Slice the chorizo in three large pieces. In a stockpot or 5-quart Dutch oven, add all the ingredients and season with about a tablespoon of salt. Bring up to a boil and reduce to a simmer. Let the soup simmer uncovered for about an hour. Remove the soup from the heat and retrieve the chorizo pieces and the ham hock. Using an immersion blender or working in batches on a countertop blender or food processor, purée the soup until smooth. Return to the burner and let simmer while you finish with the garnishes. While the soup simmers, preheat the oven to 375°. Cut the ribs off the chard and mist the leaves with olive oil. Dust them with a little bit of salt. Bake for about twenty minutes or until crisp. When cool enough to handle, crumble the chard into small pieces. Finely dice the chorizo removed from the soup and set aside. Remove all the meat off the ham hock and shred it, tossing any excess fat . In a small frying pan (non-stick works fine), add about a teaspoon of olive oil and fry the diced chorizo and shredded ham. 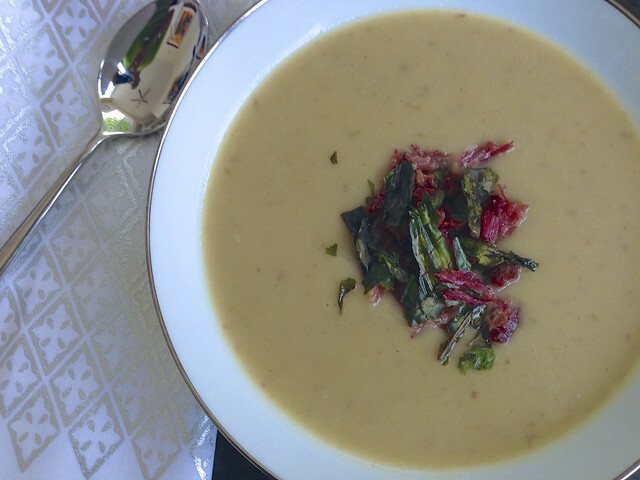 Serve the creamy caldo gallego in bowls, topping with the crisped chard, chorizo and ham pieces. Here’s to a tasty and healthy 2013! This looks very good, Adriana! Our weather is so cold here in NJ…perfect weather for soup! That sounds delicious! Just got your adorable Christmas card – love the three Kings arrangement in the photo.